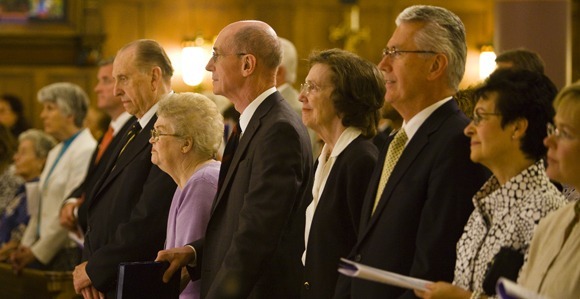 The Church News invited four women whose husbands have served as General Authority colleagues of President Thomas S. Monson to share thoughts about Sister Frances J. Monson. My husband and I have many special memories of President and Sister Monson’s visits to Germany over the years. One time we accompanied them on a very rainy day in Dresden to visit the burial place of a missionary. In spite of the terrible weather, she had a radiance of goodness about her. I was always impressed with the way Sister Monson complimented her husband and supported him in every way. However, I also noticed that she was a wonderful person in her own right. I have enjoyed listening to her as she shared her opinions and experiences. We will miss her friendship, her beautiful smile, and her kind spirit.